Dressed in the pumpkin orange maintenance colors, this Amtrak offering is among the second set of roadnames for AHM's Alco Century 424 and one of the few known to have been actually released from that second helping. Above are two views of AHM's C&NW Alco Century 424. Notice the model includes two different slogans, one on each long hood side as one done on select C&NW diesels at one time. Walthers includes a listing for an AHM Alco C-424 Set in a 1982 advertisement. The set, an exclusive available only thru Walthers, included a powered and dummy C-424 and wide vision caboose all decorated for Penn Central. 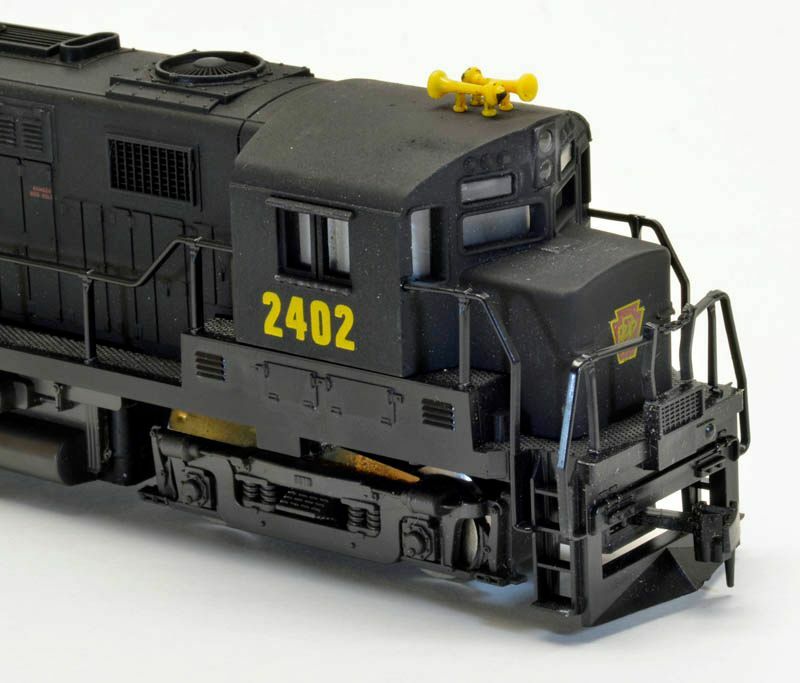 Built by Roco in Austria, this HO-Scale ALCO Century 424 is an above average example among AHM's diesel offerings. Joining AHM's catalog in 1975, detail on the model is very good and the loco benefits from all-wheel drive. 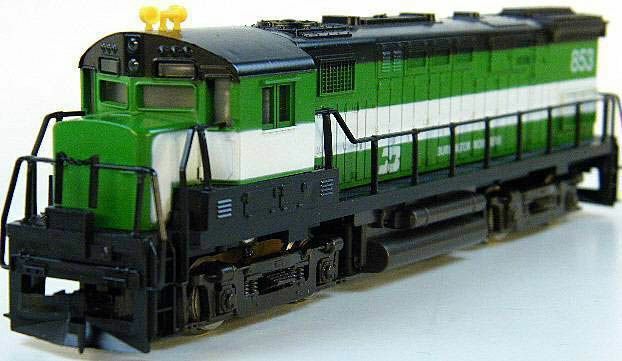 Roco produced the 1970s Atlas HO-scale diesels, as well as another round of product for Atlas in the form of a series of Alco S2-S4 switcher models in the 1980s. Roco also made Walthers' SW1 and original release FM H10-44 switchers in the 1990s. 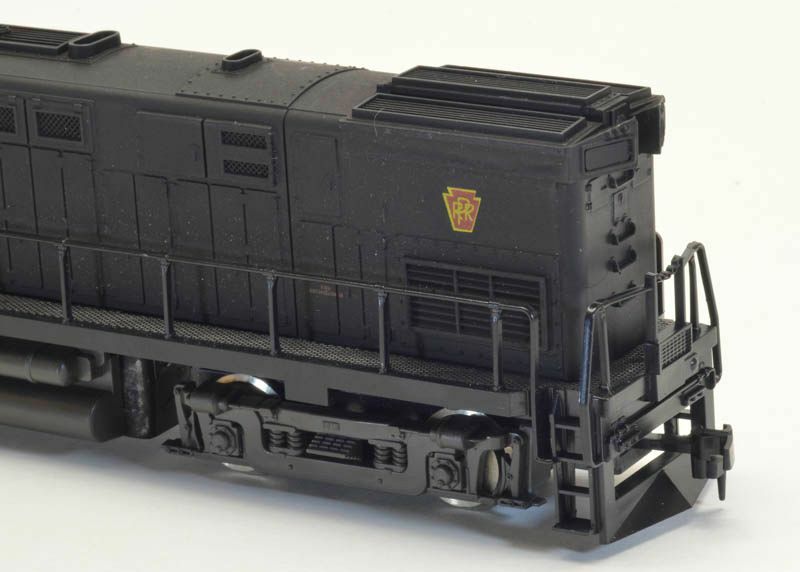 There are a couple odd details regarding this model of ALCO's Century 424. Most notable is the inclusion of an EMD-like dynamic brake fan on top of the unit just behind the cab. This is totally incorrect with respect to prototype. The error likely can be traced to a drawing published in Railroad Model Craftsman magazine in the 1960s, which included this incorrect feature. The other interesting spotting feature of AHM's C-424 is the slanted rear number boards. Correct only for early Phase I prototypes, this makes AHM's Century a very unique example of this ALCO diesel. The C-424 appears first in AHM's 1980 product catalog with a suggested retail of $19.98. The May 1980 issue of Model Railroader includes a review of new proudct releases announced at that year's HIA Trade Show. AHM announced a new group of roadnames for the Century 424: Penn Central, Pennsylvania, Erie-Lackawanna, Conrail, Spokane Portland & Seattle, Reading, and Amtrak. Two roadnumbers were to have been available for each of the announced new seven roadnames. To date, I've never seen any of these C424 models, beyond Amtrak, Penn Central, and Pennsy examples. Additionally, some AHM boxes for its Century 424 includes Chessie and M-K-T examples. I have never seen either Chessie, nor M-K-T Century 424s from AHM. AHM's Century 424 is missing from catalogs as of the 1981 edition. To date, no other manufacturer has surfaced with this tooling, making the AHM offering the only time this example of Alco's Century 424 from Roco was offered.